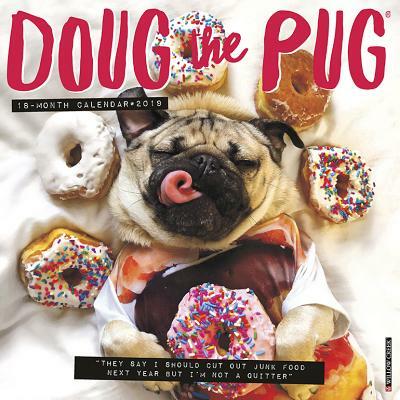 With over 13 million followers across his social media and well over 1 Billion Facebook video views, Doug The Pug is one of the world's most famous and most followed dogs. With his New York Time's Best Selling book, top-selling calendar, sold out meet and greet events and a merchandise line, Doug's reach goes far beyond the internet. He even starred in music videos for Katy Perry, DNCE and Fall Out Boy He won the Instagrammer of the Year award at the 2017 Shorty Awards, was nominated for a Nickelodeon Kids Choice Award, and has garnered the attention from national TV shows such as Good Morning America, The TODAY Show, The Doctors, and This Morning, and has been featured on Jimmy Fallon and The View. Doug has countless celebrities who champion him including Justin Bieber, Ed Sheeran, Steven Tyler, John Legend and Chrissy Teigen, Shakira, Katy Perry, Dolly Parton, and more. The large format, 18-month wall calendar features grids with ample room for jotting notes and reminders. Also included are six bonus months of July through December 2018 as well as moon phases, U.S. and international holidays.